Angus & George proudly display their butterfly collection. Saturday 24th Nov was the end of a great week! About 55 people gathered at the Euroa Arboretum for a morning of butterfly catching, face painting and art, a delicious BBQ and some fascinating ‘show and tell’ after lunch. Plenty of kids and parents were on hand to catch butterflies for our makeshift butterfly house and Peter and Steve (our visiting moth experts) shared some more words of wisdom with us. Ben had some great displays and stories about butterfly-parasite relationships, whilst Janet shared with us her amazing collection of butterfly cards and other memorabilia. Bert showed the childhood butterfly and moth collections of local MP Bill Sykes and Cathy gave us all pointers about how to create a butterfly garden. 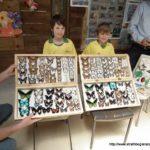 Perhaps the stand-out show & tell came from George and Angus, accompanied by their Dad, Douglas, who showed us their superb collection of butterflies, collected both locally and from northern Australia. It was a great session! Michael Spencer, Chair of the SR CMN Committee brought the day to a close by thanking our sponsors (Australian Government, GB CMA) and all who participated in the week-long event, for joining in to raise awareness of biodiversity in the region and to learn more about this important group of insects – the Lepidoptera. With a bit of luck and funding, we hope to hold a similar event again. David Kelly, a Euroa Arboretum volunteer, put together a lovely newsletter including a summary of the day – here. And here are a few pickies (45 actually) of the day.